5 March to 22 March – Tickets available here. In his directors notes to Stop Kiss, Anthony Skuse cites Roland Barthes A Lovers Discourse: Fragments (Noonday Press, New York 1978) to further explain Callie’s position in Stop Kiss as a catastrophe – a crises of immediacy that means through one event, everything is changed forever. Stop Kiss is a love story between two “straight” women who have to deal with the all too real political consequences of falling in love, but it is also about the externalisation of love, the seething underneath that, expressed or otherwise dictates the surface. Love is always a radical act, a shocking inexplicable relinquishing of self to an other destined to result in as much pain as pleasure, and what better way to perform this catastrophe than through homosexual love? While the physical assault on Callie and Sara is a political act of violence through which society must confront itself, it is also a consequence of the catastrophe of love and much of Callie’s initial hesitancy and her subsequent reluctance stem from our own overwhelming need for passionate connection at constant odds with our desire to self protect. Callie (Olivia Stambouliah) is a New Yorker with one of those very New York jobs that seems glamorous, for which there are awards, but it soulless and uninspired. She is a traffic reporter who rides in a helicopter every morning. She is in an on/off relationship with George (Aaron Tsindos) a connection that is convenient, soulless and uninspired. She is on her way to a drinking night with her college buddies, when Sara (Gabrielle Scawthorn) a friend of a friend for whom Callie has offered to cat-sit, arrives with the pet and a charming magnetic personality that Callie didn’t see coming. As Stop Kiss moves back and forth in time, we watch the women fall in love, all the while knowing at the moment they kiss, Sarah will be beaten by a witness into a coma that will change both of their lives forever. Stop Kiss, written by Diana Son in 1998 moves back and forth through time. 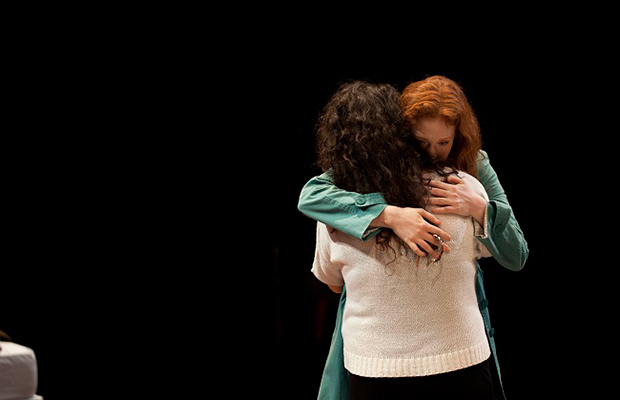 We know early on that this love will have shocking consequences, but the plays duration focusses on the events surrounding the two central catastrophes – the kiss and the assault – so that we are brought into the heart of these women and the importance of their love affair through the duration of the performances. It is not what happens to Callie and Sara that is most important in Stop Kiss, it’s who we are when we love, what courage we need to find, what subversive longings must take precedence over self-protection, that are the examined subjects. To further support this notion of what is hidden beneath, Anthony Skuse inverts the theatre experience so that the musicians, change rooms and wings of theatre are brought to the stage. The audience sits either side of the performance, which takes place in a strip down the middle, like a corridor, or a pathway. Scene changes happen to the thud of a loud drum or the impassioned voice of Suzanne Pereira (also assistant director) accompanied by its own echo, further implying an abyss into which Callie in particular stands on a precipice ready to fall. Scene changes are abrupt, busy, transformative and yet fluid, lucid and clear. The performers busy themselves with moving furniture and objects as if they are literally marching to the beat of a different drum. It’s never an alienating experience, rather it draws the audience closer because of its unapologetic intimacy, something we are longing for in the two principles for whom desire is starting to overcome convention. Anthony Skuse is always concerned with what is happening underneath, behind, at the edges and off to the side as if these are the places where the real action prepares to present itself. None of this subtlety is possible without impeccable performances, and the fine cast make themselves a flawless canvass for the collaborative vision of Anthony Skuse constructing Diana Son. Olivia Stambouliah is a jovial, celebrating Callie, using an ‘in-your-face’ New Yorker attitude to mask a personality that avoids true desire at all costs. She carries the weight of the play easily on her capable shoulders, with a flawless New York accent, and a particularly careful addressing of Son’s dialogue, allowing for moments of hesitation or sentences cut short to occur naturally, removing all barriers and providing complete access to her characters depth. She is perfectly balanced against Gabrielle Scawthorn’s Sara, a woman physically her opposite, and in so many ways braver than her. This love affair in the hands of these two women is entirely convincing, the attraction palpable and chemistry revelatory. Scawthorn’s performance moves into the sublime further into the play, during scenes that inevitably end in audience tears. Watching these two women discover themselves in their awareness of each other is an impeccable piece of theatre. 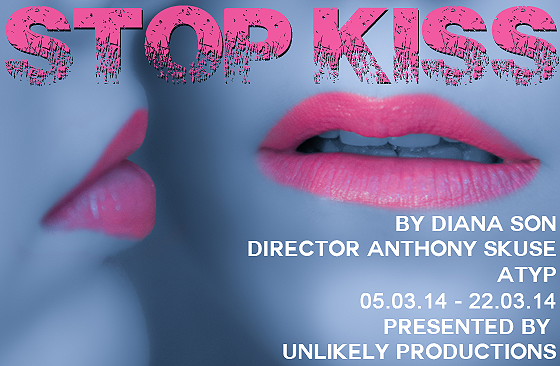 Stop Kiss is also a collection of superb satellite performances and a crew of gifted creatives each producing their best to bring a brilliant production to thrilling life. The best theatre speaks to many layers, and part of the message of Stop Kiss is that love is always political and there is a still unsolved problem for society at the core of GBLT love. Along side of this is a story of the catastrophic life altering nature of love, as impossible to understand as it is to examine as it is to explain.